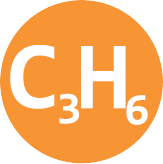 Need compressed and various mixtures of propylene (C3H6)? After ethylene, propylene is the second most important starting product in the petrochemical industry. It is the raw material for a wide variety of products. We deliver gaseous and compressed propylene in a variety of bottles, tanks and cylinders to fit your application needs. Please see the table below for information and to access safety data sheets on propylene available from WestAir.